A largely self-taught painter who began his career as a portraitist, Bingham here blends landscape and genre, and as such hints at a transition occurring in his career. The trio of figures in conversation enlivening the picturesque view suggests his growing interest in genre scenes, developed as a result of his contemporary William Sidney Mount’s success in that arena. Like his masterpieces The Jolly Flatboatmen and Fur Traders Descending the Missouri, Cottage Scenery was purchased by the Art-Union directly from Bingham. Through a lottery, the progressive organization guaranteed its members a chance to win one of the original paintings featured in its annual exhibition. It also popularized those paintings by distributing thousands of prints of them to its members across the country. John D. Carhart of Macon, Georgia, was the recipient of this canvas, which remained in his family for more than 100 years. 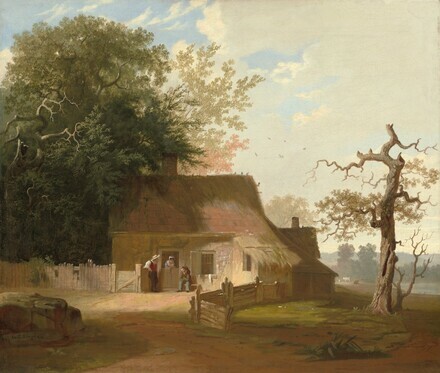 Purchased 1845 from the artist by the American Art Union, New York; won 1845 by James D. Carhart, Macon, Georgia; by descent through the Carhart family; (Berry–Hill Galleries, New York); purchased 1960 by Lawrence A. Fleischman, Detroit; (Kennedy Galleries, New York); purchased 1961 by the Corcoran Gallery of Art, Washington; acquired 2014 by the National Gallery of Art. American Art Union, New York, 1845, no. 98. Romantic America, John Herron Art Institute, Indianapolis,1961, no. 4. George Caleb Bingham, 1811-1879, National Collection of Fine Arts, Washington; Cleveland Museum of Art; Art Galleries, University of California, Los Angeles, 1967-1968, no. 12. Corcoran [The American Genuis], Corcoran Gallery of Art, Washington, 1976, unnumbered catalogue. George Caleb Bingham, Saint Louis Art Museum, National Gallery of Art, Washington, 1990, no. 2. The Century Club Collection, Corcoran Gallery of Art, Washington, 1993, unpublished checklist. Shapiro, Emily Dana. "George Caleb Bingham, Cottage Scenery." In Corcoran Gallery of Art: American Paintings to 1945. Edited by Sarah Cash. Washington, 2011: 88-89, 260, repro.